History of 0% APR Interest Rates + Who’s Carrying a Monthly Balance? 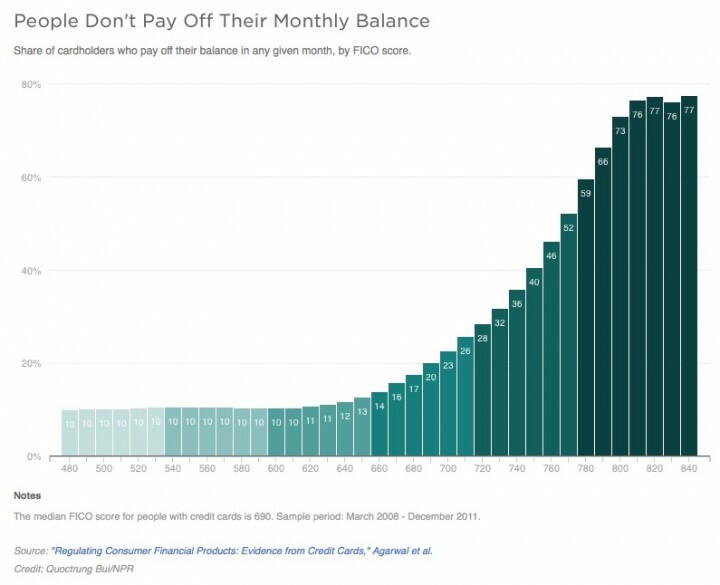 There’s also a chart showing the percentage of cardholders who pay off their balance in any given month, based on their FICO score. The rise of 0% APR interest rates. In 2001, nobody was getting 0% APR interest rates. In 2004, there was a huge spike and that was basically “Peak 0% APR”. Since then, 0% rates have stayed around, gradually decreasing in popularity, until 2013 when there was again a slight uptick. This doesn’t account for the changing length of 0% APR promotional periods. In 2005, there were a lot of 0% APR offers but they were usually for 6 to 12 months. As overall interest rates have remained very low across the board, there aren’t quite as many 0% APR offers available, but the best ones are for longer terms – up to 24 months. Right now, you can get 0% APR for 15 months with no balance transfer fee, or 0% APR at 21 months with a balance transfer fee. 77% of folks with a 700 FICO carry a balance each month. 64% of folks with a 740 FICO carry a balance each month. 27% of folks with a 800 FICO carry a balance each month. On the other hand, even 27% is higher than I though it would be. A lot of people with “good” and even “excellent” credit carry balances each month. How many people are carrying balances after the 0% introductory period ends? Obviously, there is a reason that 0% APR offers are still around. But that reason isn’t completely explained above. Does 0% APR encourage “new” debt from people who wouldn’t otherwise carry a balance? For example, is it possible to look at 6 or 12 months after the 0% intro period ends, and see if that marks an increase in balances? Or are 0% APRs mainly a tactic to attract balances already held at other card companies? If you DO pay your balances in full, you can still reap the benefits of your good credit score without paying interest. It’s now been a while since I was earning thousands of dollars in “free money” from 0% balance transfers. But the silver lining is that back in 2007 a “good” sign-up bonus was $100 while nowadays you can easily find credit card bonuses with $500 value. I would say it is even less work to manage a few new cards a year vs. juggling 0% balance transfers which required making last-minute payments to maximize interest earned, and thus worrying about missing a payment deadline. A quick smartphone snapshot of credit cards in my wallet shows well over $2,000 of accrued bonus value – 2 free nights at any Hilton hotel for which I got over $1,000 value, $800 in American Airlines airfare (separate $500 in airfare credits offset the annual fee), 40,000 Ultimate Rewards points good for $500 in travel, and 40,000 American miles (former US Airways card). This is addition to any cash back/miles/points for purchases, free checked bags, or extended warranty perks.